Are you a local business looking for seasonal help? 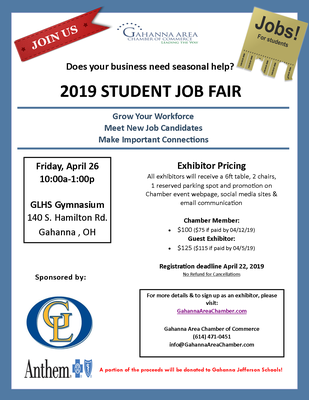 Promote your summer job openings to Gahanna Lincoln High School students at our annual Student Job Fair! All business exhibitors will receive a 6 ft display table with 2 chairs; 1 reserved parking spot; company name & logo on all promotions including GACC website, Facebook and email blasts. Registration deadline is April 24, 2019 @ noon! A portion of the proceeds will be donated to Gahanna-Jefferson Schools.